The initiative started in 1992. A conference with a Christian background organised by “Fundación en Alianza” and the pedagogical workshop of the Schoenstatt Movement. 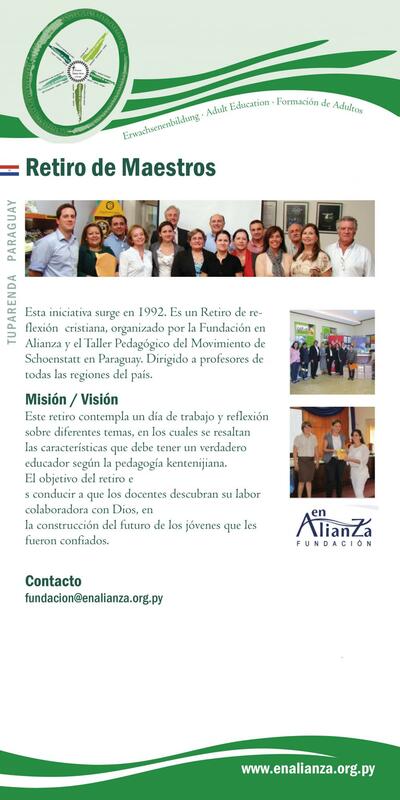 An invitation is directed to all teachers throughout Paraguay. They are invited to attend a day of reflection on various subjects connected with characteristic qualities of educators according to Fr Kentenich‘s pedagogy. The goal of the conference has been achieved when the teach- ers realise that when they carry out their educational tasks, and through helping to build the futures of each of the children entrusted to their care, they at the same time help to carry out God‘s plan.